Traffic accidents are often the result of careless and sometimes reckless behavior. 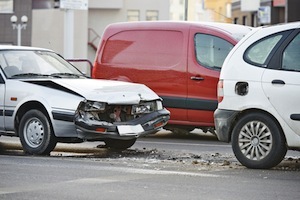 A common type of collision is when one vehicle rear-ends another. Manchester residents who have been hurt in a car accident can seek guidance from Attorney M. Jeanne Trott as they pursue compensation for their injuries. As a former nurse specializing in acute care trauma, Ms. Trott has a thorough understanding of the medical issues resulting from rear-end collisions. The immediate period following a car accident is often very traumatic and stressful. Frequently, it is necessary to preserve evidence and take immediate action to preserve your legal rights. During your free consultation, you will speak directly with Attorney M. Jeanne Trott regarding your claim. Contact us at 603-624-7500 to discuss your claim and arrange a free consultation. Driving a car requires a certain level of responsibility. When operating a motor vehicle, all individuals are expected to follow the rules of the road. In the case of a rear-end collision, one driver is often following another vehicle more closely than is reasonable. If a rear-end collision takes place, that driver may be at fault. Negligence is the legal term for the failure to use reasonable care. Since all drivers are required to meet a standard of reasonable care, if they breach this duty, and their breach causes an accident, they may be held responsible for any resulting injuries and damage. A driver who strikes another vehicle from behind is often found to have breached the duty of care. This is because he or she has not kept enough distance between cars, which is crucial to driving safely because vehicles sometimes stop suddenly and unexpectedly. While the driver following too closely may be deemed negligent for the rear-end collision, the other driver could also be partially at fault. New Hampshire maintains a modified comparative fault rule. Under this law, a victim cannot recover compensation if they are shown to be at greater fault than the defendant driver. On the other hand, if they are not more than 50 percent at fault, they may be able to recover compensation reduced by their degree of responsibility. Statutes of limitations restrict the time period that an individual can bring a lawsuit. Under New Hampshire law, to recover damages for car accident injuries, a victim must file a lawsuit within three years from the date of the crash. New Hampshire’s statute of limitations generally prevents personal injury lawsuits from being brought after this period of time ends. Victims of rear-end collisions may seek damages for both economic and non -economic harm. Economic harm might include medical expenses, physical therapy, missed wages, the costs of future treatment, and repairs to a vehicle. Non-economic damages such as emotional distress or pain and suffering can potentially also be recovered, depending on the circumstances. If you have been a victim of a rear-end collision, injury lawyer M. Jeanne Trott can help you pursue compensation in a New Hampshire court. Ms. Trott brings over 25 years of experience to representing accident victims, and her work as a medical professional furthers her understanding of the impact on clients’ quality of life. She has assisted injured individuals throughout the state, including in communities such as Hooksett, Auburn, and Candia. Call us today at (603) 624-7500 or use our online form to set up a free consultation.